Now if anyone reading this or following my blog ALSO follows me on Twitter you will think that I've officially lost the plot recently and all over a certain Disney film which I FINALLY got round to watching this last weekend. Yes, I can hear you're gasps of shock, horror and maybe a few thuds from people fainting. How can a girl like me who is obsessed with strong, muscular, blood-thirsty, brave and even terrifying Vikings EVER become enchanted by a Disney film? I am still a girl at heart and I always keep my inner child alive and well with my imagination and romantic tendancies. And I am sucker for a good fairy-tale - with this one having an interesting twist it made me even more susceptable to its charm. And with the charismatic, cheeky, lovable rogue of a man that is the handsome Flynn Rider he really was the icing on the cake (although his real name is....nope I won't say it might spoil the surprise in the film if anyone dares to watch it hehehe) ...and yes he does prove to be worth a 'swoon' or two at the end. 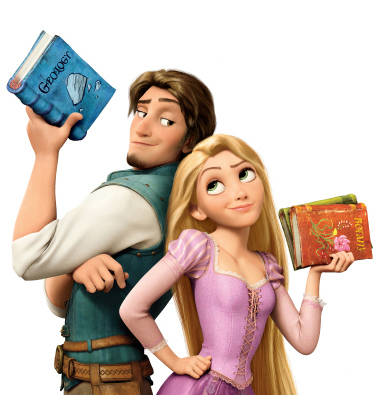 See even my new favourite Disney characters love books! 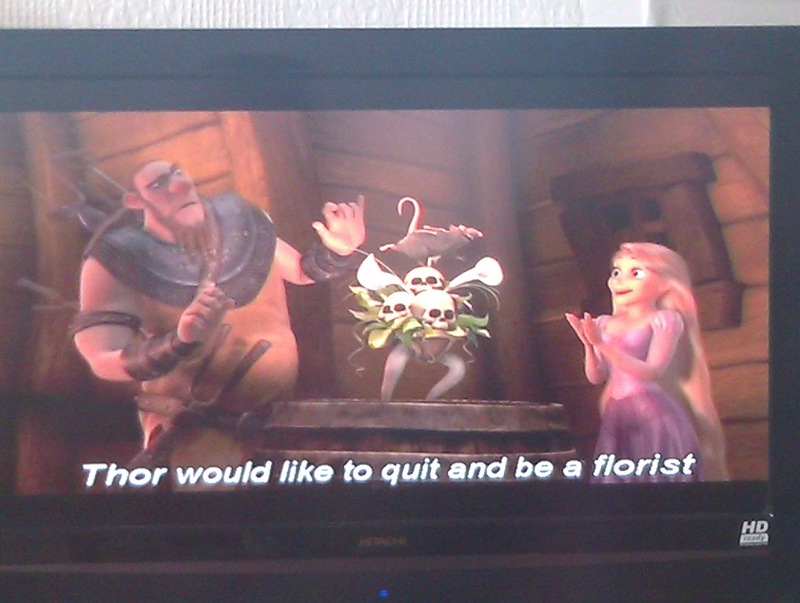 Plus I also heard the name of a Norse God in the film although why he's been linked to flower arranging I will never know but at least he doesn't have a horned helmet hehehe. Oh he only appears for a split second half way through a sing-song called 'I have a Dream'. All the songs were brilliant, including the love song and I've been singing it to myself a lot recently so I've actually proven how much I loved this film by ordering the sound track so at least I can sing along to actual music and not just play it in my head. Anyway, I confesss to watching 'Tangled' repeatedly each evening from my favourite parts being the scenes where love finally blossoms and the ending which ....well... I daren't say too much about that either but I think it was a really heart-felt genuine ending that actually moved me emotionally. Yet a little bit of a clue is in this rather clever and rather funny video I discovered courtesy of the 3D World magazine. For this poor princess may get her lover but she doesn't get the happy ending that Rapunzel did. Enjoy! I have to say, I'm with you on everything you said in this post! I love Tangled, especially a certain character by the name of Flynn Rider (^__~), and I find myself singing along with the songs at the most random times. Great film.